Summary: In human and animal medicine blood chemistry profiles are routinely run for diagnostic and health monitoring purposes; however, there are species such as the loggerhead sea turtle (Caretta caretta) that the meaning of these basic parameters are unknown. This project is aimed to identify activities of six biochemically important enzymes in 28 body tissues of the loggerhead sea turtle. 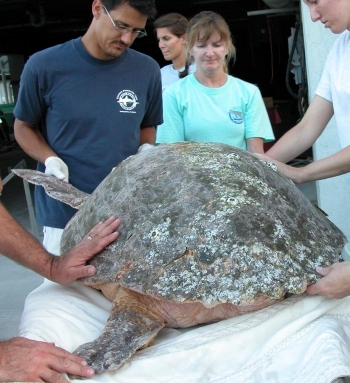 Samples will be taken from five loggerhead sea turtles that strand and are brought to Mote Marine Laboratory for rehabilitation, and subsequently die and are necropsied. A total of 27 tissue samples plus plasma from each turtle will be analyzed for six enzymes, including alanine aminotransferase (ALT), aspartate aminotransferase (AST), alkaline phosphatase (ALP), lactate dehydrogenase (LDH), gamma-glutamyl transferase (GGT), and creatine kinase (CK). Tissue samples will be taken, homogenized, sonicated, and centrifuged to produce tissue supernatants that can be evaluated for these six enzymes activities. Knowledge of which tissues contribute to increases in these biochemical values will allow clinicians to make quicker and sounder decisions on proper treatment regimens. The results of this study will greatly increase the usefulness of a serum/plasma biochemical profile in regards to diagnosis and health assessment for sea turtles that are in rehabilitation as well as those maintained in captivity.